products to trial on my blog, from lovely skincare Australian based company Moo Goo, that cater for both mummy and baby's skin. I was so excited that they had included something for both Oscar and I! First up is the Mini Moo Bubbly Wash. I was so excited to try the gentle formula, made from special, comforting ingredients such as Colloidal Rice Bran and Aloe, so it is perfect for sensitive skin. Oscar is doubly prone to eczema from both Mitch and me, and reacts to sudocream and perfumed wipes, just like I do. This makes for the perfect soothing night time bath - for mummy, daddy and baby! I love that it doesn't contain Sodium Laureth Sulphate, a substance used in most bubble baths that is notorious for drying out hair and skin! I can use the Wash alongside my OGX range to keep lovely, healthy locks. 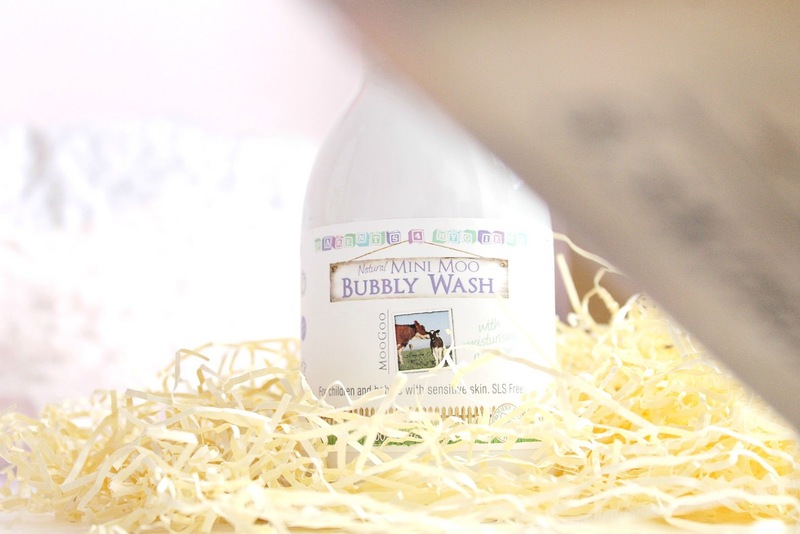 It creates the hugest mound of film star bubbles I have seen and carries a very subtle scent. It is also safe for the smallest babies and little children that love to eat the bubbles in the bath aka Oscar, as it is just about edible - there are no harmful or irritant chemicals. Now that the colder months are approaching I will look forward to using this in our baths to add a few extra gazillion bubbles! Next up is the 'Earth' natural tinted cream. I am always longing to jump on the skincare bandwagon and embrace new skin products like other bloggers, but sadly my face is not so keen. So many ingredients seem to bring my skin out in a rash, Simple products and anything with tea tree in being the main culprits! 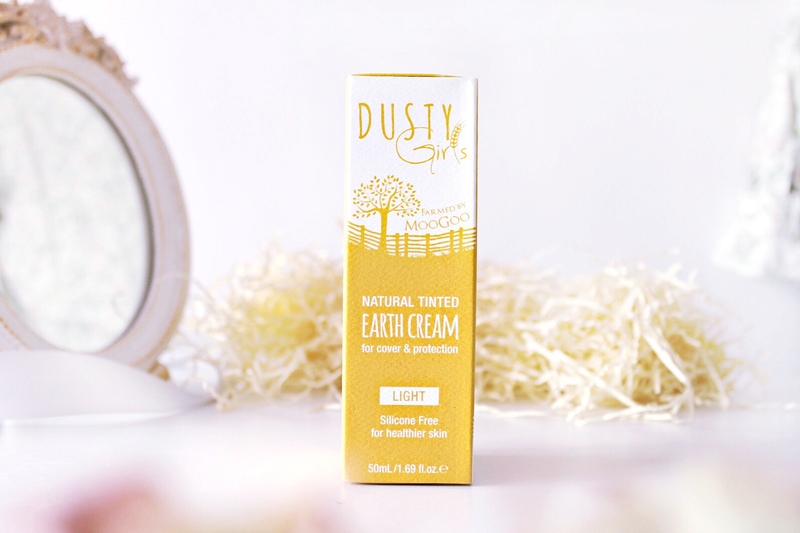 Farmed by Moo Goo, the Dusty Girls cosmetics range aims to create a naturally beautiful look. This cream is so curious! It has a light clay like colour and scent, and thick consistency when first swatched on the hand but blends seamlessly in to the face, creating a beautifully smooth, silky complexion. It's like nothing I've tried before; tinted creams I've had previously had too light a coverage - a watery texture - but, although it is thicker, this feels weightless. I feel that it works by smoothing out my pores and imperfections, creating dreamy skin. See it blended in above, creating a lovely, soft base! It's also vegan friendly and specially designed for acne prone skin, aiming to provide you with a perfect countryside glow and the radiant complexion of one who has spent the day hiking *thinks of Lake District* *remembers old belief about drizzle rain being good for complexion* All synthetic chemicals have been replaced with skin loving ingredients such as Nigella Sativa Oil and Magnolia extract, which work to feed the skin. I'm so happy to have found this - and can't wait to try more from Dusty Gals! These products sound lovely! My sister has just had her baby so i am deffo going to show her these!! I actually have a Dusty Girls review coming in a couple of days! 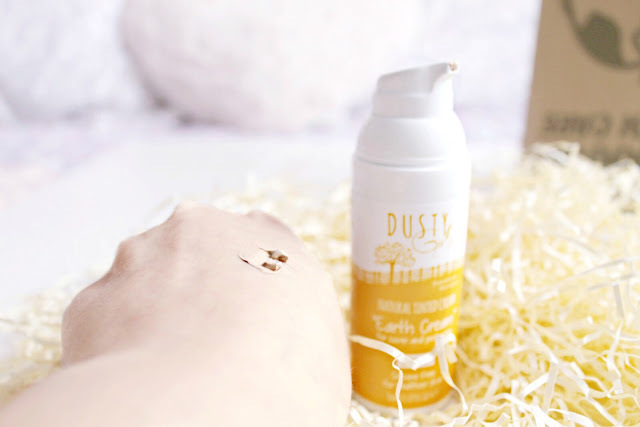 Lovely to hear your thoughts as well though :) I love the sound of the Earth cream, it looks like a lovely formula. This sounds really nice and has an adorable packaging. Oo I must try that tinted cream, it sounds amazing! I like that it's got a bit more coverage then other tinted creams.